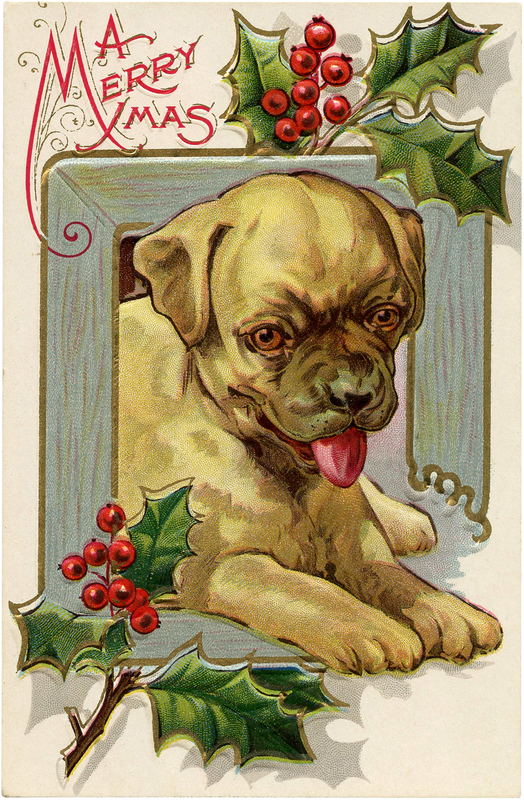 In this set of images, we’ve put together some darling Christmas Dog Images! For many of us pets are a big part of our Holiday Celebration as they bring so much joy to the festivities. Featured here are several different Dog breeds, many of them include Holiday greenery on the image, and some are just cute or funny. These would be great to add to your Holiday Decor, or use them in your Holiday Crafts or Gift Wrapping for your Pets or Family members. Isn’t this adorable?! This darling Christmas Dog Image shows 4 cute little pups! 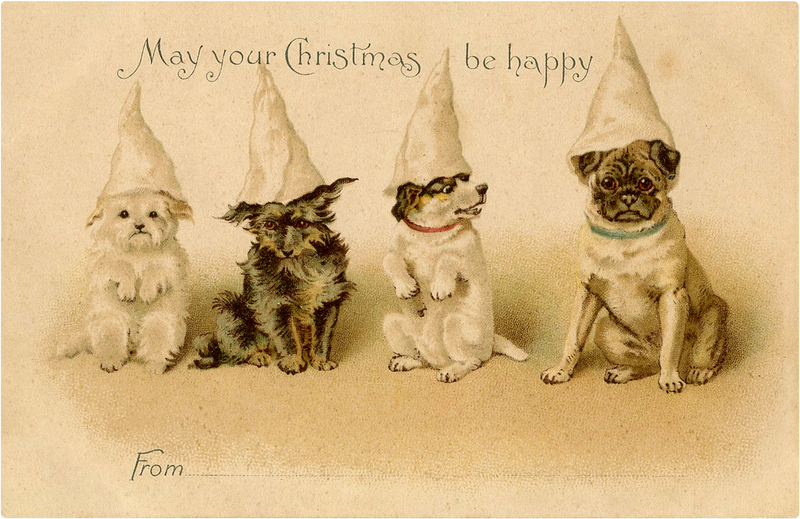 Each of these little guys are wearing a paper cone shaped Party Hat on their heads. This Antique card has a spot where you can fill in a name on the “From” section, so you could use it for a gift tag. 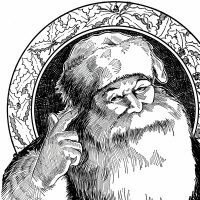 The sentiment is “May your Christmas be Happy”. 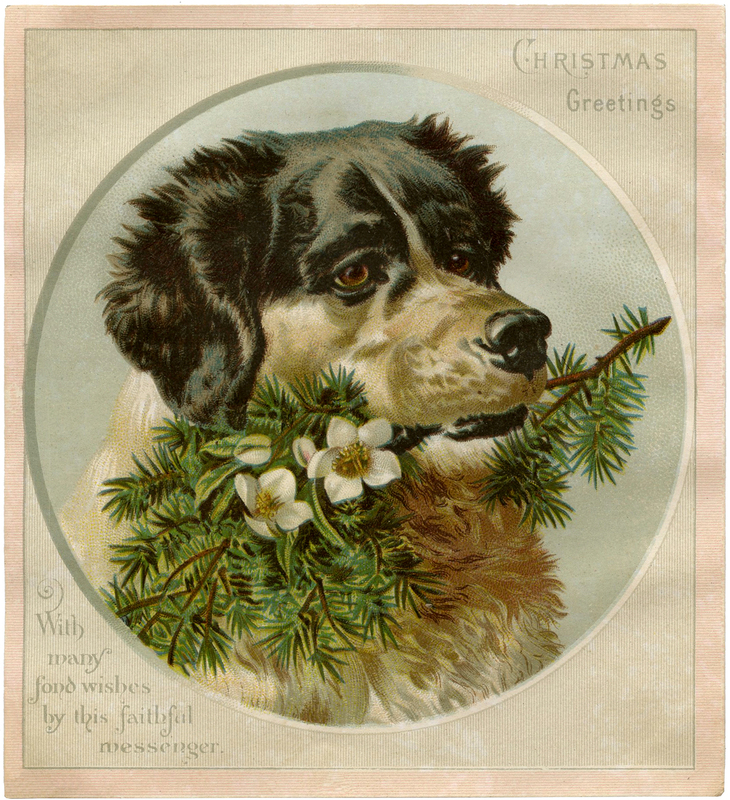 This is a Beautiful Vintage Christmas Dog Image! 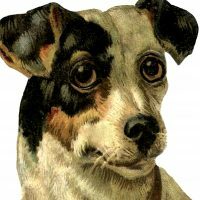 Shown above is a wonderful Antique Victorian Christmas Card, with a lovely Dog on the front of it! He’s got a festive looking Pine branch in his mouth. The message on the card is “With many fond Wishes by this Faithful Messenger”. So sweet! Be sure and check out this Handmade Button Pendant, using this image! This is a Beautiful Christmas Dog Image that coordinates with the Dog above! 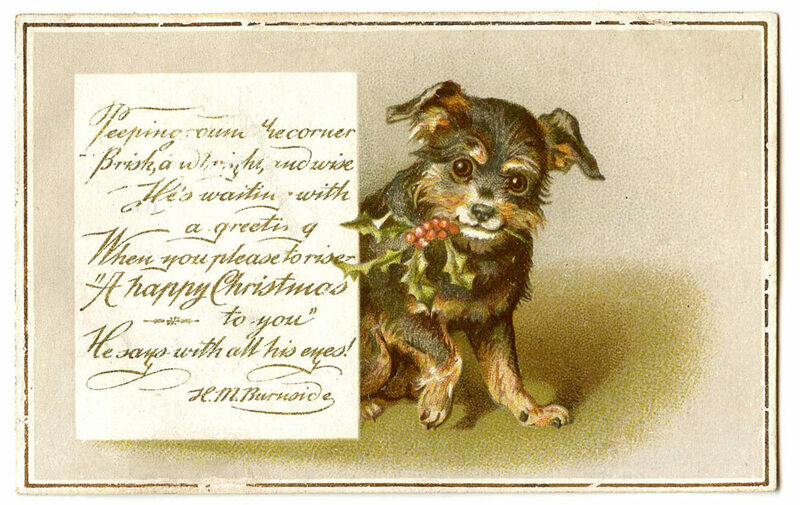 Shown above is a wonderful Antique Victorian Christmas Card, with a lovely Brown Furry Dog on the front of it. He’s got a festive looking Holly branch in his mouth. The message on the card is “This Faithful Messenger bear thee my Christmas Wishes”. So sweet! Next we have this Vintage Christmas Dog Freebie! 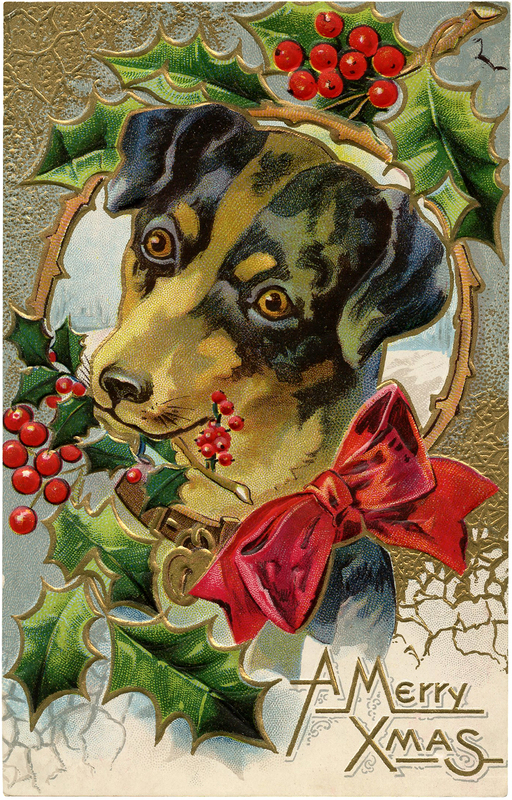 Shown above is a fabulous old Christmas Card featuring a festive looking Pup wearing a Red Bow and a Sprig of Holly in his mouth! This next Holiday Dog Image coordinates well with the one above it. Shown here is a cute old Christmas Card featuring a festive looking Pup framed up by Sprigs of Holly! 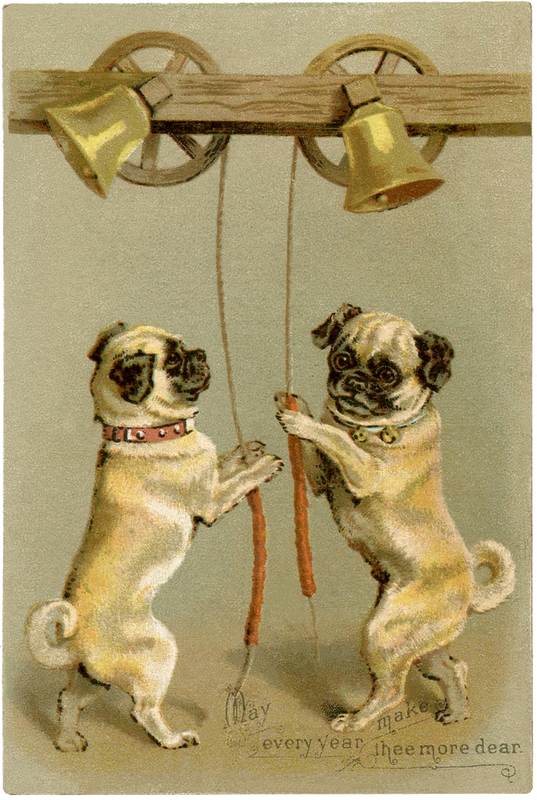 This cute Christmas Dogs Picture is an old Antique Trade Card! 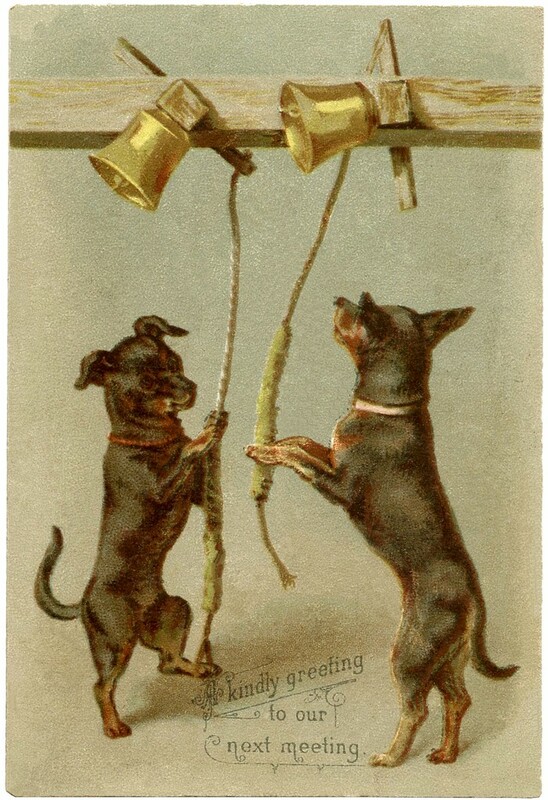 Shown above are 2 darling fluffy white Dogs ringing a pair of Bells. Fun! This is part of a series, I have several of these cards as you’ll see below, but I’m not sure if I have the whole series. I think this was probably used for New Years but it could work for Christmas as well. Most likely the cards date to around the 1880’s. 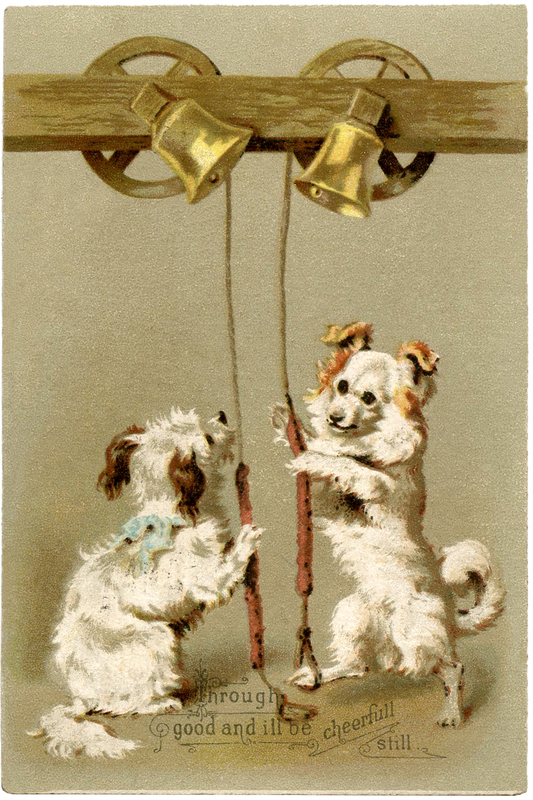 This cute Christmas Dogs Picture is another old Antique Trade Card! Shown above are 2 darling fluffy white Dogs ringing a pair of Bells. Fun! This Pug Stock Illustration is the third in this series! Shown above are 2 adorable Pug Dogs ringing a pair of Bells. So cute! 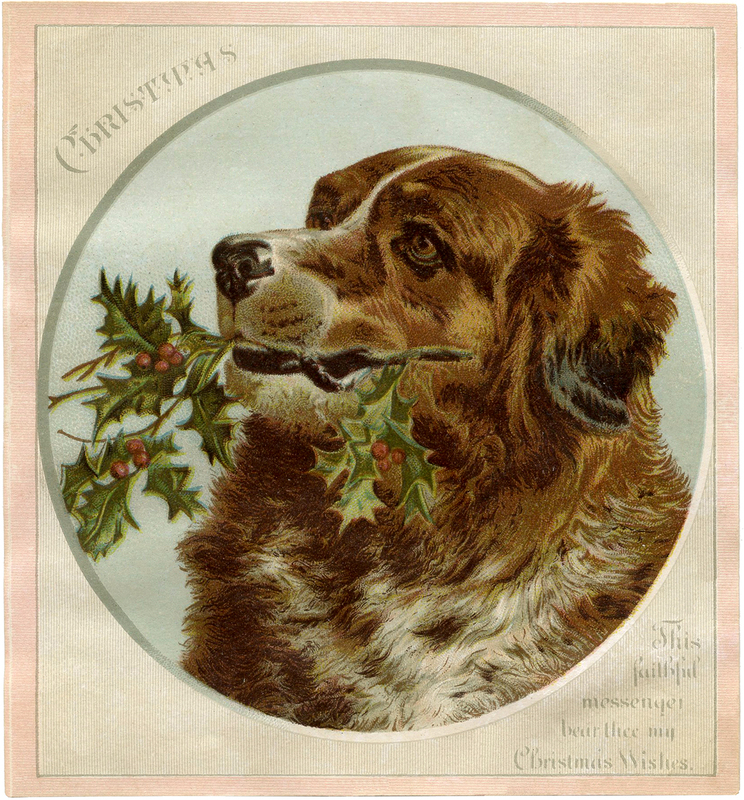 These darling Vintage Christmas Images, show a cute Dog with a sprig of Holly in his mouth. The original is at the top, I’ve also created a second graphic with the words removed. I think it would make a charming Holiday Gift Tag! You can find the matching Cat Graphic HERE. I hope you enjoyed this adorable collection of Christmas Dog Images today! You might also like our collection of Children with Pets HERE. Thank you for all the images you post. I have made a Christmas signature using the poodles. http://www.craftingwithjack.blogspot.com Have a wonderful Christmas.